The OCEC provides a unique resource for student research projects. Below are examples of how Oberlin anthropology students have used elements of the collection to explore, analyze, and digitally showcase larger themes in missionary history and Oberlin’s past. 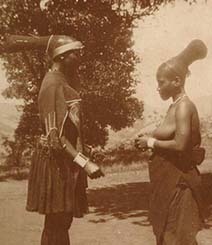 Two Zulu women dressed in traditional attire interact at Adams Mission in 1916. 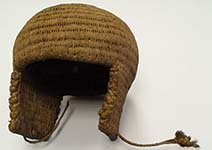 Helmet made from coconut fibers, used in warfare in the Gilbert Islands. Collector: Edward Church. The roughly 1600 ethnographic objects comprising this database represent cultures of Africa, Asia, the Pacific and North America. They were collected during the late 19th and early 20th centuries primarily by alumni of Oberlin College who served as missionaries and teachers abroad. The objects, which their collectors perceived largely as souvenirs, mementos, and trophies of conversion, were donated to the former Oberlin College Museum. Unlike systematic natural history collections created at the same period, documentation and contextual information provided by collectors of ethnological material is often uneven. Nonetheless, a major goal of the Oberlin College Ethnographic Collection Project has been to preserve high-quality digital images of each object in the collection, along with all associated information from the official Accession Book of the Museum. We invite you to browse the database, a resource for students and professionals with interests ranging from anthropology, art, and religion to history and museology/museum studies. A grant from the Andrew W. Mellon Foundation to the Five Colleges of Ohio for the integration of digital collections into the liberal arts curriculum supports the translation of a previous version of the database into a CONTENTdm format as well as the creation of a web interface to guide its use by students and scholars. Project Co-Directors: Linda Grimm, Emerita Associate Professor, and Amy V. Margaris, Assistant Professor, Department of Anthropology, Oberlin College. Library staff members who provided vital assistance include Alan Boyd, Associate Director of Libraries, Cecilia Robinson, Electronic and Continuing Resources Assistant; Ken Grossi, Oberlin College Archivist, Megan Mitchell, Reference and Instruction Librarian, Xi Chen, East Asian and Web Development Librarian; Geneva Dampare (OC '12) served as the research associate for this phase of the project. Students of Museum Anthropology provided the original stimulus for this effort and worked under the direction of Linda Grimm for three years to catalogue and photograph each of the roughly 1600 items in the collection. Albert Borroni, Director of OCTET, provided invaluable assistance through the development of our initial customized content management system, as well as equipment and technical support with the photography. The Department of Anthropology and the Office of Sponsored Programs provided funding for research assistants.